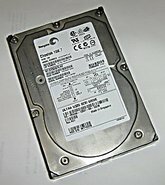 Seagate - ST373307LW SEAGATE - CHEETAH 73.4GB 10000 RPM ULTRA320 68 PIN SCSI HARD DISK DRIVE. 8MB BUFFER 3.5inch LOW PROFILE (1.0inch). ST373307LW IN STOCK. SHIP SAME DAY. Seagate - ST373207LW SEAGATE - CHEETAH 73.4GB 10000 RPM ULTRA320 68 PIN SCSI 3.5INCH INTERNAL HARD DISK DRIVE (ST373207LW). IN STOCK. SHIP SAME DAY.